Nutty brussels sprouts, rich eggs, and flavorful Pecorino cheese make a quick and delicious (not to mention healthful) pasta sauce that's ready in the time it takes to boil water and cook pasta. Inspired by traditional pasta carbonara, in which the hot pasta "cooks" the eggs for the sauce, this dish is best when the best possible eggs are used. People concerned about raw egg consumption may want to leave them out entirely and just coat the pasta with the veggies and cheese. Bring a large pot of water to a boil. Add 1 tablespoon of the salt and then the pasta. Cook until the pasta is tender to the bite (starting to test it a minute or 2 before the guidelines on the box). While the water comes to a boil, prep the brussels sprouts: Trim off and discard any browned or dried ends; pull off and discard any dried out, browned, or yellowed exterior leaves; use a kitchen mandoline or sharp knife to cut the sprouts lengthwise into thin slices. The brussels sprouts slices will fall apart into shreds a bit, which is exactly what you want for a varied texture in the final dish. While the pasta cooks, in a large frying pan over medium-high heat add the olive oil, garlic, and red pepper flakes. When fragrant and sizzling, add brussels sprouts and remaining 1/2 teaspoon salt. Cook, stirring occasionally, until the brussels sprouts are soft, about 3 minutes. Reduce heat to low and keep warm, stirring occasionally. In a large bowl, whisk the eggs until they're well-beaten. Add the cheese and stir to combine. Set aside. When the pasta is done cooking, drain and immediately add to the egg and cheese mixture. Toss to coat the pasta (it's important to do this while the pasta is still very hot since the heat from the freshly cooked pasta will lightly cook the eggs and melt the cheese, which makes the final "sauce" of this creation). 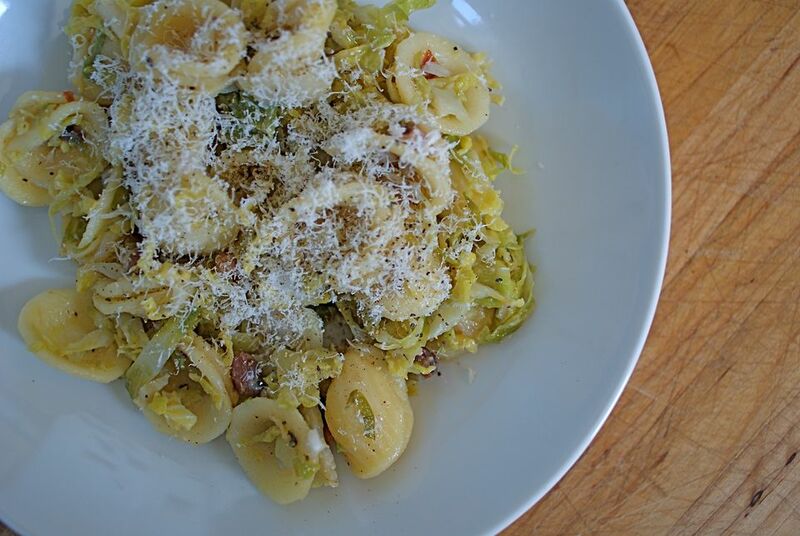 Add the hot or warm brussels sprouts mixture to the pasta and toss to combine thoroughly. Toss and toss to fully mix the pasta and the vegetables together. Add more salt, pepper flakes, or cheese to taste. We've also been known to grind in some freshly ground black pepper for good measure. Serve hot.